Milou Skincare Moisturizing Cream Review (2018): Does It Work? Milou Skincare Anti-Aging Moisturizing Cream Review: Does This Moisturizer Really Work? Milou Skincare Anti-Aging Moisturizing Cream, valued at US $100, is one of those moisturizer skin care products exclusively available online and which can only be accessed by signing up for a limited time free trial offer that compels you to pay only a minimal fee of about US $5 to cover for product handling and shipping. About Milou Skincare Anti-Aging Moisturizing Cream — Does It Really Work? There is no information available about this product’s makers. All information available about this product is from affiliate marketers and other third parties, and which cannot be verified in the absence of an official manufacturer or product website. Improve dark marks and other darkened skin imperfections. Smoothen the appearance of wrinkles and fine lines. Tighten your pores and give your skin a more refined surface. Enhance your skin’s moisture content. Speeds up the rate of skin cell repair, regeneration and renewal. 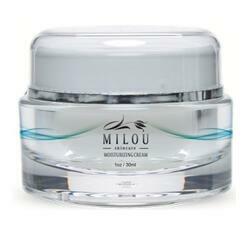 What Are The Ingredients In Milou Skincare Anti-Aging Moisturizing Cream? Milou Skincare Moisturizing Cream is formulated with naturally sourced ingredients that have been proven to improve the youthful appearance of mature and aging skin, although the manufacturer does not provide details of what constitutes every jar of this cream. This product is available via a limited time free trial offer that requires an initial investment of only US $5 for you to try this product. There are no available official and verifiable information about this product and about its makers. The manufacturer fails to disclose the complete list of ingredients that this product is formulated with. Milou Skincare Moisturizing Cream may only be accessed by signing up for a free trial offer that requires you to share your credit card information and to authorize the company to bill you for future charges. Different third parties are quoting different sets of claims and ingredients for this product which does not give you much security when you’re after guaranteeing your own skin’s safety. Does Milou Skincare Anti-Aging Moisturizing Cream Have Any Side Effects? In the absence of a full list of this product’s ingredients and given the limited product reviews, consider that side effects may be experienced when using Milou Skincare Anti-Aging Moisturizing Cream. As a precaution, perform an overnight patch test to check for any allergic reaction you may have against any of this product’s components. Milou Skincare Anti-Aging Moisturizing Cream may indeed be capable of delivering what it says it can deliver for your mature skin. However, you should require proof because when it comes to skin care, you may be risking your health and well-being too. With this product, there appears to be more questions raised than answered. You should look at your other options and compare.